We have to be thankful to the Supreme Court for their determination on the proposed “Divineguma Bill”. It exposed further inherent dangers of the 13th Amendment other than police and land powers. If only the Supreme Court had in 1987 taken such a stand when this draconian Amendment forced on us by India that it required the approval of the whole country through a Referendum, we may not have been in this pass today. The Supreme Court took a similar independent stand which facilitated the de-merger of the Northern and Eastern Provinces. This again underscores the importance of independence of the Judiciary. In hindsight, one is tempted to think whether this country missed a golden opportunity in its omission to follow up on the immediate aftermath of the defeat of the LTTE in May 2009, to take steps to abolish the 13th Amendment before our adversaries could recover from the shock of defeat. 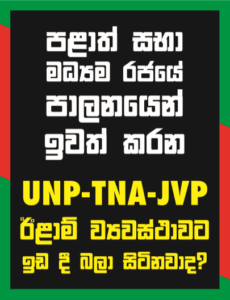 The government may get away this time, by managing to get a kind of approval of all the Provincial Councils except of the Northern Provincial Council which is non-existent, because they command the majorities in all the other functioning Provincial Councils, for the moment. And the implication is that the Bill if passed, (not withstanding Sec. 154(G) of the Constitution) might be inoperable in the Northern Province unless/or even if it is passed with 2/3 majority in Parliament. What does it in effect mean? That the mandate of the Center will not cover the whole country. Can a small country afford this? Thus, there is lurking danger of a possible dismemberment of this unitary state which is the most fundamental feature of our Constitution. One has to bear in mind how tenuous it is even with government’s own majority and despite their shrewd moves, it could still be out smarted by even a section of their own group. This was demonstrated by what happened in the North Central Province in electing a president for that council. The British colonial government in their pragmatic wisdom retained Sri Lanka’s unitary character as the best form of governance for this country. They improved it further with an effective network of roads, railways and telecommunications. Now it is further enhanced with radio communication, mobile phones and internet facilities. These facilities have made this country shrink still further helping it further effective in governance, trade and general co-ordination making Provincial Councils superfluous. Tamil Nadu government has been bringing significant pressure on the central government owing to their sympathy towards the LTTE and latterly towards secessionist tendencies in Sri Lanka. It is alleged in some quarters that Tamil Nadu government was able to effectively twist the arm of the Union government to vote against Sri Lanka at the last session of the UNHRC at Geneva which no doubt damaged its image as the leader of SAARC countries. The dominant feature is that latterly the state governments India are asserting more power in that country to reduce the power of the center and thereby effectively weaken the authority of the Central government. This is not in the best interest of India’s strength as a nation especially in the face of threats of possible balkanization of India in order to prevent it from emerging as a strong power. Also we have to take into account the close proximity of the 60 million strong Tamil Nadu state to especially the Northern Province of Sri Lanka and the ethnic affinity between that state and the Northern Province where the cessesionist forces are looming large. What if Tamil Nadu state one day succeeds in breaking away from the Indian Union and directly interfere with Sri Lanka’s territorial integrity by moving to annex Sri Lanka’s Northern Province to it? In fact, before the advent of the Western Powers, down the ages this country has been plagued by invasions from South India from time to time. Thus, a resumption of this threat again is not quite impossible. Hence I think Sri Lanka has to bear in mind this threat to its security and territorial integrity which is looming large, in dealing with the threat of 13th Amendment. This is perhaps the last opportunity for Sri Lanka to remedy this great error. As much as this government was responsible for the dismantling of the 30-year-old LTTE Terrorist ensemble and save this country from disaster, it is left to them to courageously act now to eliminate the final obstacle to national unity. But let us identify the real enemy. The real enemy is not the Judiciary but the 13th Amendment. That is why we should be thankful to the Judiciary for providing this opportunity. Perhaps this alone may ensure another term in office for this government. And District Council may be the optimum level of devolution for effective national re-integration.